The ability to store a variety of items, the protection of the books/multi-media on library shelving and efficient storage for student files are important issues for managers of educational institutions. Whatever type of shelving system you need, Euromech can optimize your space with its mobile shelving systems. 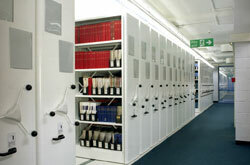 Euromech’s high density mobile and compact shelving systems provide a unique and complete multi usage storage solution contributing directly to cost reduction and creating more available space inside facilities or library for increased storage in each department.